Islamabad, Jan. 10 : British Foreign Secretary David Miliband has said that there is no threat to the democratic set up of Pakistan, as Islamabad has the full backing of the international community in preserving the democracy. The News quoted Miliband, as saying that a democratic set-up is the best option for Pakistan and the current government has proved this during the last two years. Addressing the joint news conference with Foreign Minister Shah Mehmood Qureshi here on Saturday, Miliband said that a democratic government would ensure that all friends would support Pakistan. 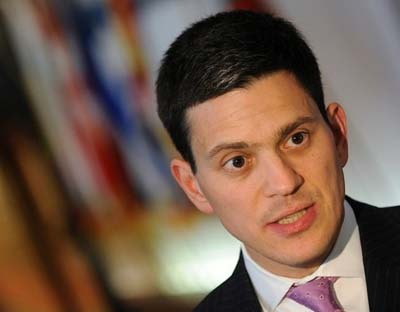 Lahore, Jan. 10 : British Foreign Secretary David Miliband has rejected claims that he held secret talks with the Afghan Taliban leadership, saying that the United Kingdom has never negotiated with any militant group. “(Taliban Supreme Commander) Mullah Omar is a criminal,” the Daily Times quoted Miliband, as saying. He, however, said, that Afghan officials were making efforts to engage the Taliban in a dialogue. Replying to a question, Miliband said he had never claimed that Al Qaeda leader Osama Bin Laden was in hiding in Pakistan, “but the Al Qaeda leader was also not in Afghanistan”. Islamabad, Jan. 10 : British Foreign Secretary David Miliband has said that Pakistan should have moved faster in prosecuting the perpetrators of the Mumbai terror attacks. The Daily Times quoted Miliband as saying that it was vital for improvement of Indo-Pak ties that Islamabad holds a speedy trial of the alleged perpetrators of the Mumbai attacks, and ensure that they are brought to justice. He admitted that there is no point in hiding the fact that after the Mumbai attacks, when he was here in January 2009, he felt that Pakistan should have moved faster. 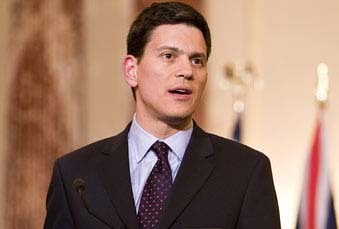 Islamabad, Jan 9 : British Foreign Secretary David Miliband said Saturday he is visiting Pakistan to understand the challenges the country is facing on political, economic and security fronts and how it is meeting them. "The reasons for my visit this weekend are, first of all, to hear from Pakistan's leaders not just in Islamabad but elsewhere in the country about the political, economic and security challenges that Pakistan faces and how it's going about meeting them," a statement issued by the British High Commission quoted Miliband as saying. Islamabad, Jan 9 - British Foreign Secretary David Miliband said Saturday he is visiting Pakistan to understand the challenges the country is facing on political, economic and security fronts and how it is meeting them. London, Dec 30 : British national Peter Moore, who had been taken captive in Iraq in May 2007, has been freed, British Foreign Secretary David Miliband said Wednesday. Miliband went before the TV cameras in London, confirming earlier reports that Moore had been released. Computer expert Moore, 36, was seized along with four British bodyguards at the Iraqi finance ministry May 29, 2007. Later, the bodies of three of the guards were handed over to the British authorities, raising fears about the safety of Moore and the remaining bodyguard. Both the leaders exchanged views on bilateral relations and regional and international issues of common concern during their telephonic conversation held today following which the Miliband invited the Indian External Affairs Minister Krishna for the conference. London, Dec 5 : US Secretary of State Hillary Clinton is said to be having a very cordial relationship with Brit Foreign Secretary David Miliband. Clinton, 62, is said to have told Vogue magazine last month that Miliband, 44, is ‘vibrant, vital, attractive and smart’. “Well, if you saw him it would be a big crush. He’s really a good guy. And he’s so young!” the Independent quoted her as saying. Miliband returned the compliment by describing Clinton as “delightful”. Kabul, Nov. 21 : British Foreign Secretary David Miliband has warned British opponents of the Afghan war that the Hamid Karzai-led government could collapse within weeks if NATO pulled out its troops now. Clinton gushed her appraisal during an interview with Vogue magazine. The interviewer added for good measure: "I got a crush over the phone in about five seconds partly because of his accent." Edinburgh (Scotland), Nov. 18 : Taliban fighters should be persuaded to lay down their arms and take seats in the Afghan Parliament to build a lasting peace in that country, British Foreign Secretary David Miliband has said. In a speech to a NATO conference here, Miliband sought to soothe growing public fears that British troops could be bogged down indefinitely in Afghanistan, promising: "This in not a war without end." The Independent quoted him as saying that Britain was ready to commit more soldiers to Afghanistan, but stressed military action had to be backed by a lasting political settlement. 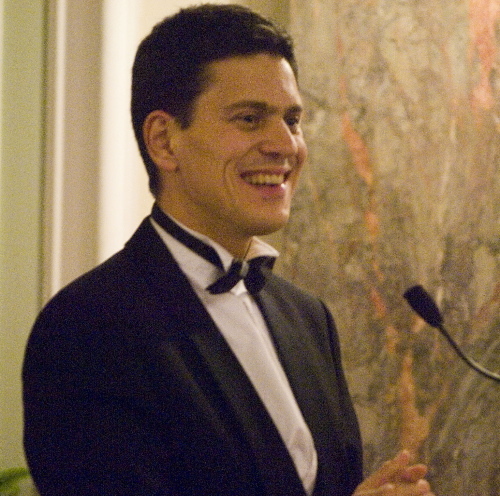 Brussels - Britain's David Miliband has emerged as the man to beat in the race to become the EU's first foreign-policy supremo, a top diplomat confirmed Wednesday. But the race to become the EU's first president is still too close to call, with the Belgian and Dutch premiers, Herman van Rompuy and Jan Peter Balkenende, the names most touted in diplomatic circles, Poland's ambassador to the EU, Jan Tombinski, told journalists. "The name of David Miliband is the most quoted name in this (diplomatic) circle, probably for the reason that Tony Blair's chances are going down," Tombinski said. London - Britain's Foreign Secretary, David Miliband, demanded on Thursday that the authorities in Iran overturn a reported four-year sentence given to an employee at the embassy in Tehran for allegedly fomenting this summer's civil unrest. Hossein Rassam, 44, was arrested in June at the time of massive street protests over the country's disputed presidential election, and according to The Times newspaper, handed a four year sentence. London, Oct 9 British Foreign Minister David Miliband has praised India's work to bring development to embattled Afghanistan. "We appreciate and support the impressive development work that India is doing in Afghanistan," Miliband told IANS at a Diwali charity dinner hosted by Indian-born industrialist Raj Loomba Thursday. New Delhi, Oct 8 : British Foreign Minister David Miliband Thursday rang up his Indian counterpart S. M. Krishna and expressed his sympathies at the suicide car bomb attack outside the Indian embassy in Kabul. "I condemn unreservedly the awful terrorist attack which took place in Kabul earlier today. Our thoughts and condolences are with the injured and with the families of those killed," British high commissioner Richard Stagg said in a statement. London - Britain's Foreign Secretary David Miliband on Saturday said the international focus was on a diplomatic solution to the row over Iran's nuclear programme. "No sane person looks at the military question of engagement with Iran with anything other than real concern. That's why we always say we are 100 per cent committed to the diplomatic track," he said. Miliband: British government did "not want Lockerbie bomber to die"
London - British Foreign Secretary David Miliband said Wednesday that the government told Libya it did not wish the Lockerbie bomber to "die in prison." Miliband, asked about the growing controversy over the release from jail of Abdel Basset al-Megrahi two weeks ago, said it was correct that the Libyans had been told London was "not actively seeking" al-Megrahi's death in prison. London, Aug 17 : British Foreign Secretary David Miliband has been rapped for his suggestion that terrorism can be a good thing at times. According to reports, Miliband had said that violent action or terrorism may be justifiable in some cases, in a tribute to African National Congress’s armed struggle in South Africa. “Yes, there are circumstances in which it is justifiable, and yes, there are circumstances in which it is effective,” Miliband had said. Washington - Two Brits take hostage in Iraq more than two years ago are believed to be dead, British Foreign Minister David Miliband said Wednesday. Miliband said Britain's Foreign Office had informed the families of Alec MacLachlan and Alan McMenemy on July 20 that credible information suggested it was "very likely that their loved ones were dead." Washington - The British people remain committed to the "vital" mission in Afghanistan despite weakened public support in recent weeks, Foreign Minister David Miliband said Wednesday. Meeting with US Secretary of State Hillary Rodham Clinton, Miliband said the military element was essential for long-term success in Afghanistan, alongside building political and economic stability.